Avast and prepare to be boarded! Here be the newest web-adventure from Judd's Hill! "Wine Booty" is a high-seas vino-centric video series showcasing Napa Valley's saltiest characters. Vintners, chefs and other celebrities in the world of food and wine drop in to have a bit of chin wag with Judd and The Pirate. The exciting new reality baseball series as the team chases the golden dream of winning the National Championship in Wichita! The series explores the various challenges, trials of the players, coaches, fans and family on and off the field! But first they have to beat one of the toughest summer baseball leagues in America: the Alaska Baseball League! Six teams of the highest caliber college baseball players in the country! "Pirates -- and their linguistics -- were onto something. "Stash." "Loot." "Bounty." But when it comes to describing the spoils (an oddly used word in of itself) of life's adventures, none really sum it up as effortlessly and elegantly as "booty." Booty is bounteous in scope. Naughty by nature. And straight up, just saying the word itself is the beginnings of a smile. The wino pirates in Judd's Hill's Wine Booty series are onto something good, too. Something I wish more pompous, self-important, secretly insecure wine snobs would adopt -- bona fide wine knowledge packed in a barrel full o' fun. Wine can be intimidating. But it's less so with the Wine Booty crew at the helm. These videos give everyday wine-loving schmucks like me some ammo against the prevailing wine douchery of the world. To these lads I raise my glass and say, "Argh!'" "This is exactly what the wine world needs more of! Fun, top-quality 'Wine Booty' from Judd's Hill." " Judd Finkelstein, the Terry Gilliam of wine country"
If you love baseball, then you'll love these baseball stories from these 2 Alaskan coaches who have trained thousands on ball players, some of the more famous alumni: Mark Mcgwire, Randy Johnson and hundreds of other MLB players. This is the first in a series of sports documentaries on the Anchorage Glacier Pilots baseball club! A documentary series﻿ about t﻿housands of talented ball players from around the world﻿ playing baseball in Alaska. The Project features Alumni interviews, a "Deadliest Catch/ NFL Films" documentary style internet series "In Flight: Pilots! " and feature film of the 2001 Glacier Pilots Team, and History of the Glacier Pilots.documentary series﻿ about t﻿housands of talented ball players from around the world﻿ playing baseball in Alaska. The Project features Alumni interviews, a "Deadliest Catch/ NFL Films" documentary style internet series "In Flight: Pilots! " and feature film of the 2001 Glacier Pilots Team, and History of the Glacier Pilots. ProPlayerInsiders.com brings a unique, behind the scenes look at the lives and lifestyles of the players of the National Football League with up-to-the-minute news, analysis, interviews, coverage of community events and featured contributions from current and former NFL players and their families offering a peek into player’s personal lives and what matters to them, on and off the football field, as well as a look at the latest health and style trends, reviews of the newest technology, musicians and much more. Napa Distillery. Located in Napa, California. It's the first distillery since the end of prohibition in the Napa Valley! They have two great locations to visit in Napa! KASR Video (aka KASR-V) was a 2 hour music video show that aired on late night public acess across the Valley of the Sun (Phoenix, Tempe, etc...) in the early 1990's from 1992 to 1996. Primarily designed to promote the Arizona State University's radio station, the program featured a mix of new alternative and metal music. A multitude of artists like Urge Overkill, Gin Blossoms, White Zombie, Greta, Grunt Truck, King Missile, Rage Against The Machine and more! If you're interested in licensing a band interview for your documentary project, please contact Robert Barr on the CONTACTS page. ​​Check out this really cool music yearbook doc- produced by Pitchfork.com, which is using some video of the great Chicago band Urge Overkill who made an appearance on an episode of KASR Video. These are three scenes in 3 minutes from the film. ​A motivational self-help book to guide you to become the best you that you can be. Nine basic steps to help you become that person. To learn more about yourself, to understand what are your best assets and most important traits. Dr. G. is a Beverly Hills-based psychotherapist who has worked with folks in the entertainment business for 25 years. He has helped musicians, actors, and studio execs make things work better, do better, and be more successful. Dr. G is also a professor of sociology and criminal justice at the prestigious Mt. St. Mary's University in hills of Los Angeles. Simple, straightforward, and easy to follow. Enjoy your journey to self. 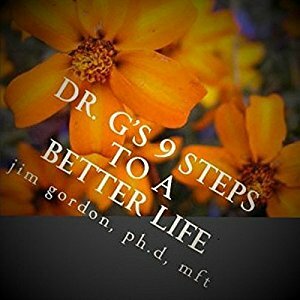 ©2009, 2010 Jim Gordon, Ph.D. (P)2016 Jim Gordon, Ph.D.